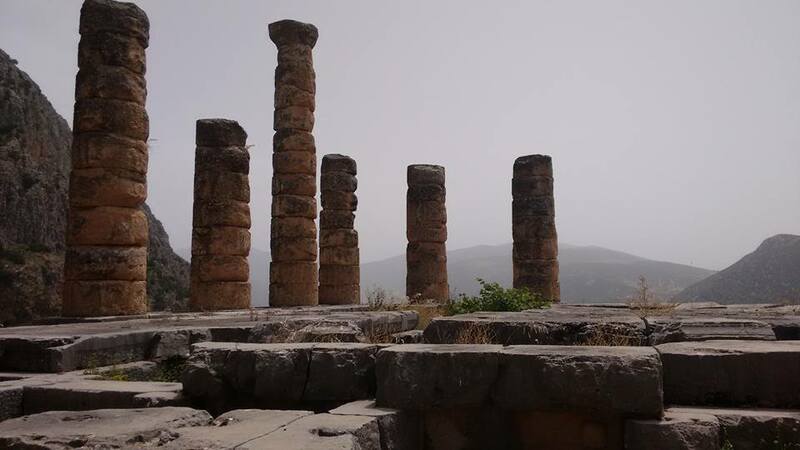 Over the weekend, we took the kids to one of our favourite places – Delphi. Marcus and I visited the town and the ruins 15 years ago, and revisiting it with our kids was something that we really wanted to do. Delphi was considered at one point, to be the centre of the ancient Greece, and some considered it to be the centre of the ancient world. 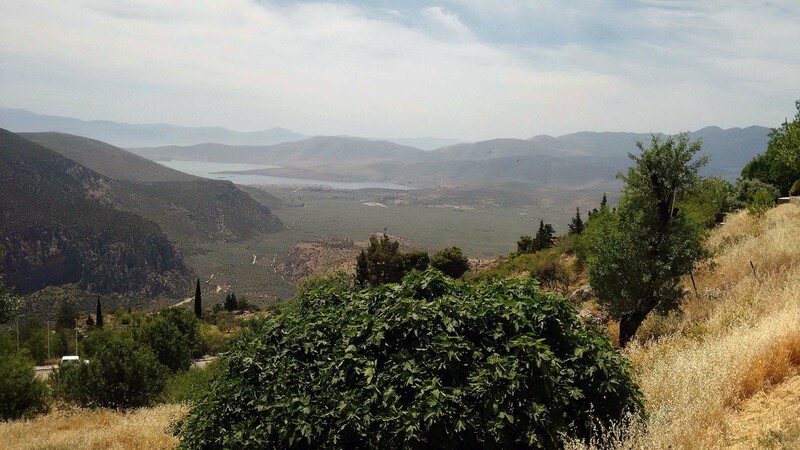 When you are on the hills at and around Delphi, you have this sense of being in the middle of “all of it”, which is why I think Marcus and I love the place so much. You look down and see a sea of olive trees in a valley surrounded by majestic hills and in the distance can see the Gulf of Corinth. Delphi was an important site for commerce. One of the first things that you see when you enter the ruins are the remains of an old market space. Multiple cities and city-states throughout Greece has a treasury at Delphi. The size of your treasury at Delphi was a status “thing”. This is the Treasury of Athens. Apollo is the primary Greek god that is associated with Delphi. The ruins contain the remains of a Temple of Apollo. Within the one end of the Temple of Apollo is the space where the Oracle would “do her work”. The Oracle would head down to a pit, within the lower level of the temple which had access to special gasses, that when combined with the bay leaves she was chewing and the water from the nearby spring would help to elicit the required state for making predictions. Artie told us before we left Athens that he was “not going to be into Delphi”. He really wasn’t. He didn’t hide it well either. The ruins at Delphi are not well shaded, and it was a hot day. The town of Delphi itself has a beautiful old-world charm about it. 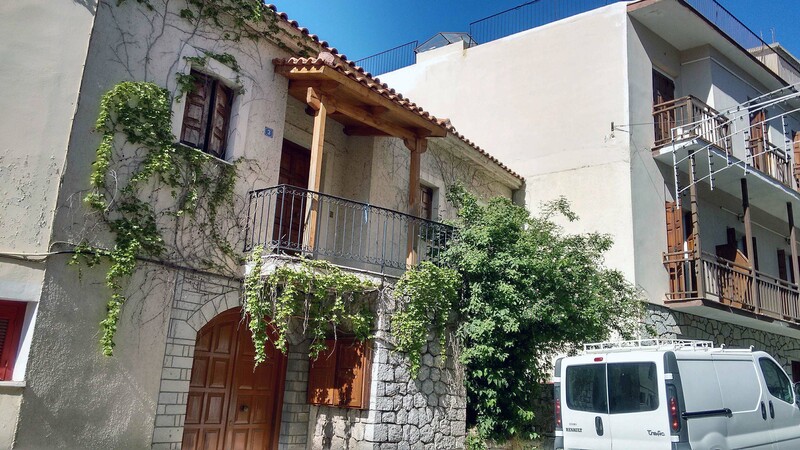 The one-way streets are narrow and filled with old buildings and flowers. By Monday, we were back in Athens. 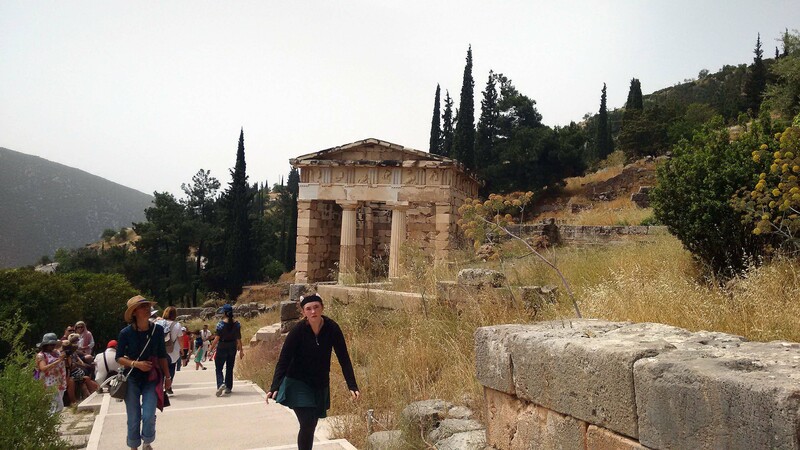 While we were in Delphi, I think that I managed to encounter some Aspartame in something that I ate or drank – because my ankles and knees had swollen up like microwaved marshmallows. They hurt too… So, the last thing that I wanted to do was walk anymore. 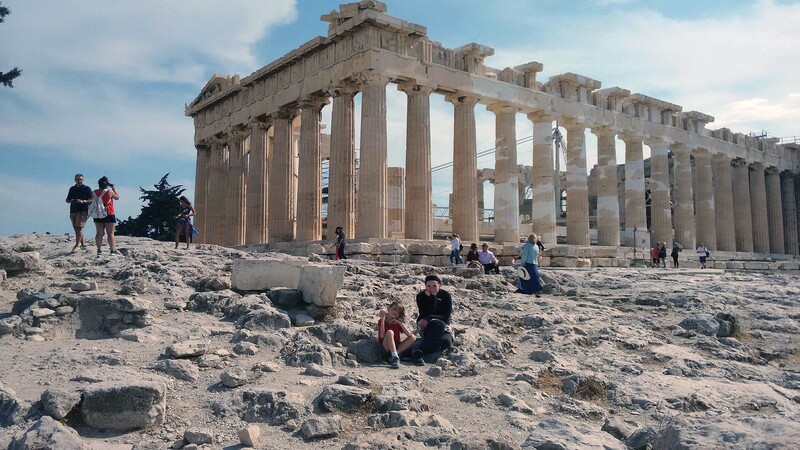 But… we still hadn’t taken the kids to see the Acropolis. 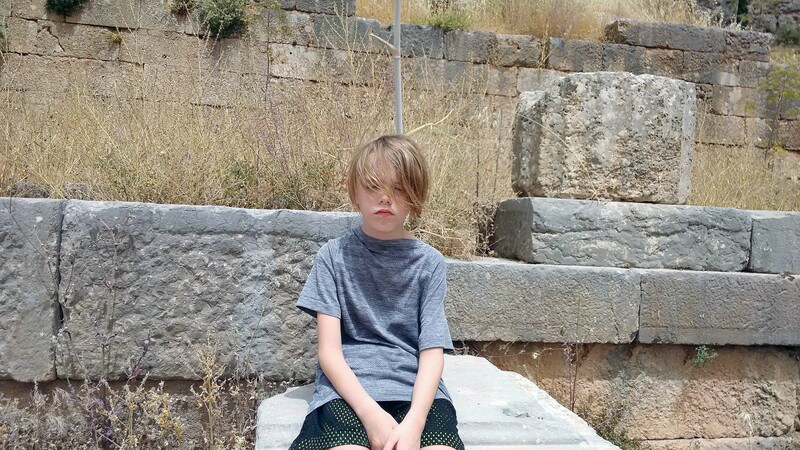 So, I waddled my way up to the Acropolis with my two children who are rapidly nearing the end of their “visiting ancient monuments” tolerance. When Marcus and I were here 15 years ago, I really wanted to see the Temple of Athena Nike. 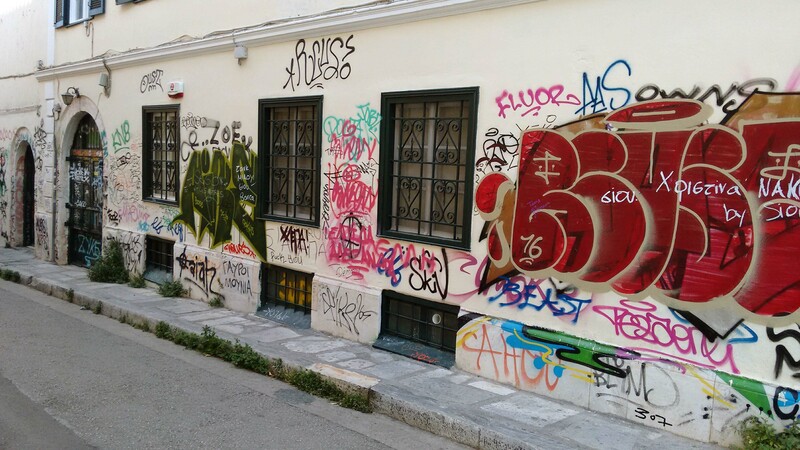 That was my whole entire reason for visiting Greece. We couldn’t find it when we got to the Acropolis and asked one of the guards about it. He pointed to where it usually was, and told us that it was out for cleaning. I had no idea that entire temples could be taken down and taken away for cleaning… It felt like one of those cruel universal jokes. This visit though, the Temple of Athena Nike was there, where it was supposed to be, and it was beautiful. Restoration work is ongoing at the site of the Acropolis, and this work was particularly evident on the Parthenon. Here’s another view of the Parthenon. 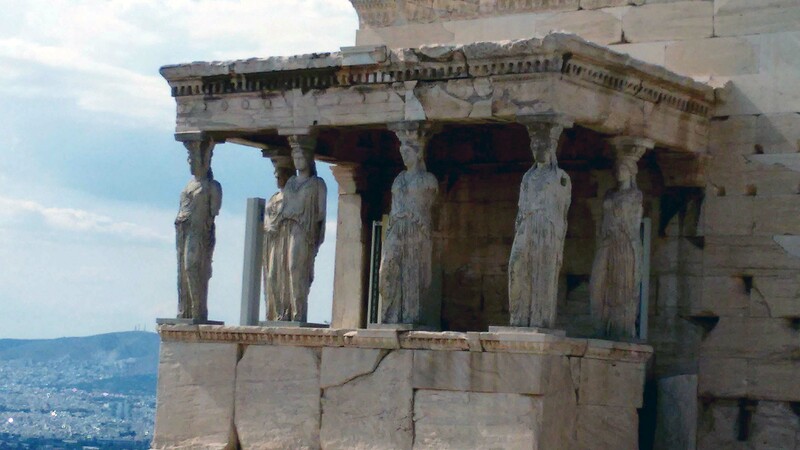 The Erechtheion temple stands out within the buildings on the Acropolis because of the statues that serve as pillars. This temple was dedicated to both Athena and Poseidon. 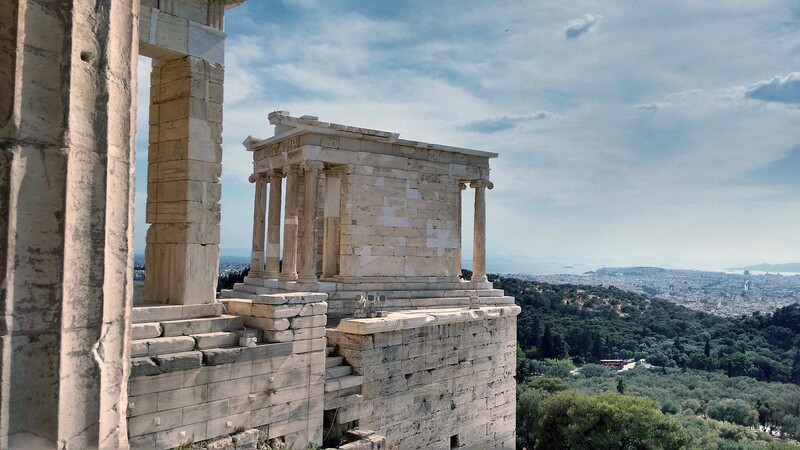 In addition to the monuments that are at the Acropolis, the elevation of the site gives you an amazing view of other sites in Athens. This is the Theatre of Dionysius. Can you imagine performing in a venue like this? 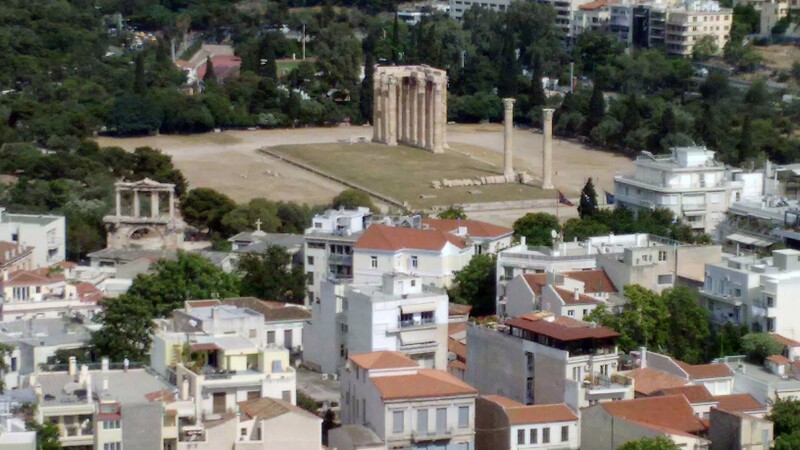 In this photo you can see the remains of the Temple of Olympian Zeus, as well as the Arch of Hadrian. Greece has gone through some economic challenges in recent years, and has also had a significant influx of political refugees. We don’t remember any begging when we were here 15 years ago. Within Athens, we encountered people begging every few feet. 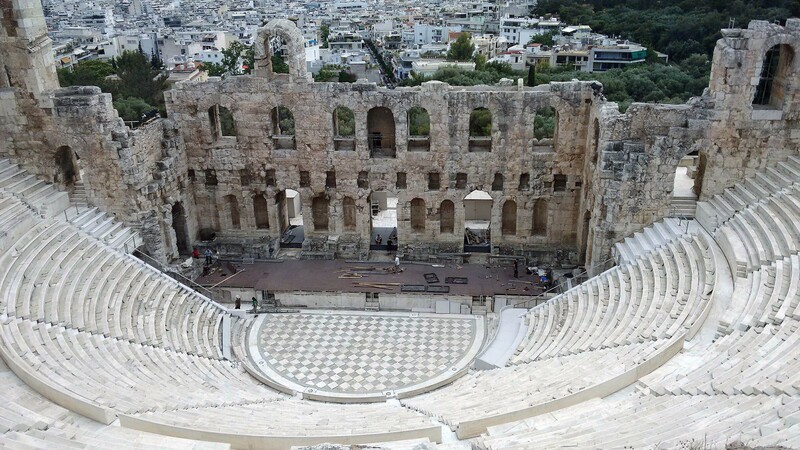 We’ve been approached directly for money more times in our time in Athens, than in the prior eight months of travel combined. There are a lot of people suffering in this city, and many of them are refugees. Seeing this city change so much, and seeing so many families in the streets suffering has been really hard to be with. We weren’t prepared for this. We weren’t prepared for how much it would get to us. We weren’t prepared for the anger that would be directed towards us… and we’re struggling with explaining all of it to our kids.